How do I download a lead report as CSV? With Leadfeeder Premium you can download a lead report very quickly and easily. STEP 1: Inside Leadfeeder choose which feed you want to use e.g. 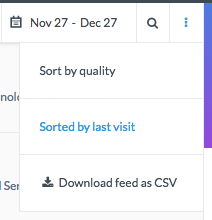 Top leads or create a new custom feed by clicking Create a new feed and choose that one after you're done. The chosen custom feed will be highlighted blue. STEP 2: Select a time range for your lead report e.g. Last 30 days. STEP 3: Once you've done that then all you need to do is click the Download feed as CSV button on the top right. Then the following screen will appear. Email the spreadsheet to yourself or anyone else on your team. 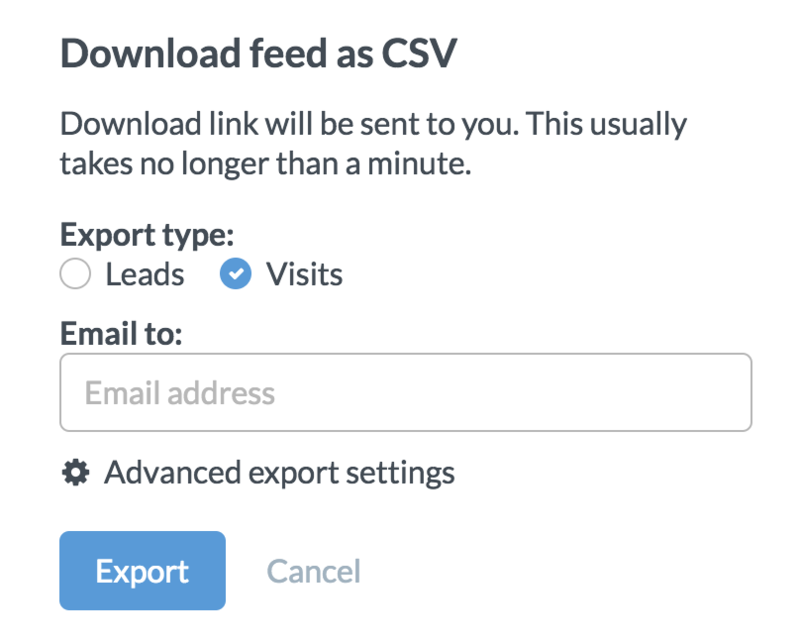 You can either choose to export details of Leads or Visits. STEP 4: Go to your email and you will find an email from Leadfeeder. By clicking on the link your report will be downloaded as a CSV file. Then just open the report with e.g. Excel. NOTE: If the file looks messy in Excel or Google Sheets, please switch the "CSV column separator" in the STEP 3. Want scheduled CSV exports as PDFs? Get the report scheduled by creating Google Data Studio report and scheduling that instead. Read more here.